Listening to someone else pray gives you an insight into their mind - their hopes, concerns, and understanding of their relationship with God. Spurgeon thought that prayer was a measure of the vitality of the church - he once ushered some visitors into the prayer meeting at his church with the words 'would you like to see the church's power plant?' These are Spurgeon's prayers taken down as he prayed them. You can learn a lot about how to pray by studying their structure and content. Each short prayer shows you the knowledge of the Bible he had and his understanding of human needs. 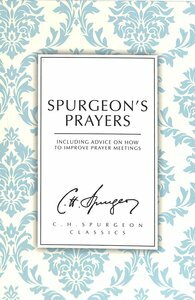 About "Spurgeon's Prayers: Including Advice on How to Improve Prayer Meetings (Ch Spurgeon Signature Classics Series)"
Using plain language and word pictures, Spurgeon shares an earnest word for those who are seeking salvation. A Certain man placed a fountain by the wayside, and he hung up a cup near to it by a little chain. He was told some time after that a great art-critic had found much fault with its design. "But," said he, "do many thirsty persons drink at it?" Then they told him that thousands of poor people, men, women, and children, slaked their thirst at this fountain; and he smiled and said, that he was little troubled by the critic's observation, only he hoped that on some sultry summer's day the critic himself might fill the cup, and be refreshed, and praise the name of the Lord. Here is my fountain, and here is my cup: find fault if you please; but do drink of the water of life. I only care for this. I had rather bless the soul of the poorest crossing-sweeper or rag-gatherer than please a prince of the blood, and fail to convert him to God. Spurgeon addresses those who know the gospel but who are outside Christ's kingdom. He teaches compellingly that to be almost a Christian is a most dangerous state, and presents the full and free salvation of God through trust in Jesus alone. 66 pages, from CFP. Here are practical guidance and biblical principles for instructing the young in what King David called "the fear of the Lord". Spurgeon proceeds on the basis that telling young people about Jesus is the most important task given to anyone, be they parent, teacher or youth leader. 160 pages, from CFP.